This adorable cabin is ready to host your romantic getaway or a place for time away from the hustle and bustle of your busy life. This cabin is tucked away high on a ridge with beautiful views, three outdoors decks and a gas grill. Sit outside and enjoy the views or star gaze at night. This one bedroom cabin that can sleep 2 adults and two kids or young teens. We provide a very comfortable king size bed and bunk beds for the kids in a separate space. The living room has a gas log fireplace for those cool mornings. We are dog friendly and welcome our four legged friends. 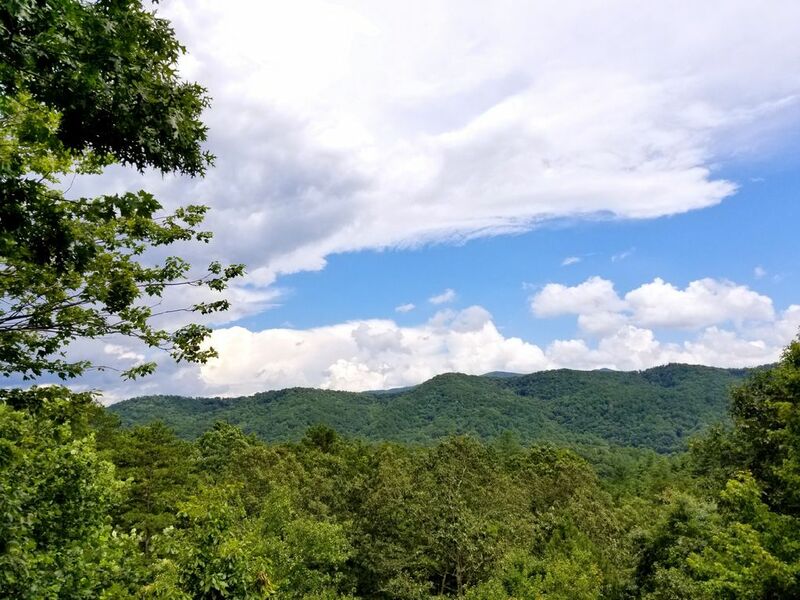 This cabin has easy access to Downtown Blue Ridge and Lake Blue Ridge, You can explore the gorgeous mountain, unforgettable waterfalls or an awesome day of trout fishing. Don't forget to stop by the Bigfoot Museum or one of the many apple orchards. Back at the cabin enjoy free wifi , Netflix or Hulu on your two flat screen TV's or step on the deck and enjoy the fresh air with a nice cool drink. When you are ready for some delicious home cooking, The outdoor grill is available and a fully equipped kitchen is ready for you to cook your favorite meal. You have been thinking about getting away and no time is better then right now. Book your North Georgia vacation getaway now and save the dates. Parking for two cars only. Must turn around in the drive when leaving. Great location in Blue Ridge. Plenty of room for me and my wife. Ray, the owner, was very attentive thriufht the whole process. The cabin had everything we needed. The view of the mountains was a bonus. We enjoyed our stay so much. Spacious, clean, and beautiful views. Ray was so responsive and accommodating. Would definitely stay here again. Lived every moment of my stay. Will be doing this again and won't stay anywhere else. Thank you Lee, I am happy you enjoyed your stay and hope you got some rest. I look forward to your return. Ray and the cabin were amazing! It was our first trip to Blue Ridge, and Ray helped to make it special. When we arrived @ the cabin, we were welcomed with soft music, wine, chocolates, water, and popcorn. The cabin was homey and inviting! It was extremely clean and well maintained. We enjoyed the hot tub and the views of the mountains. Our dogs also enjoyed their stay. It was plenty of room for the 4 of us. Ray offered many things for us to do and restaurants to try. He was available anytime I had a question! A great hostess! I just can’t say enough. We will definitely be back! Thank you, Ray. !